As a manager on the touchline, Walter Smith was always known for his dignified approach. Whenever Smith erupted, or showed true emotion, you knew for certain it would be the talk of the town for a while, as it was such a rarity. In his time since departing as manager, little has changed. 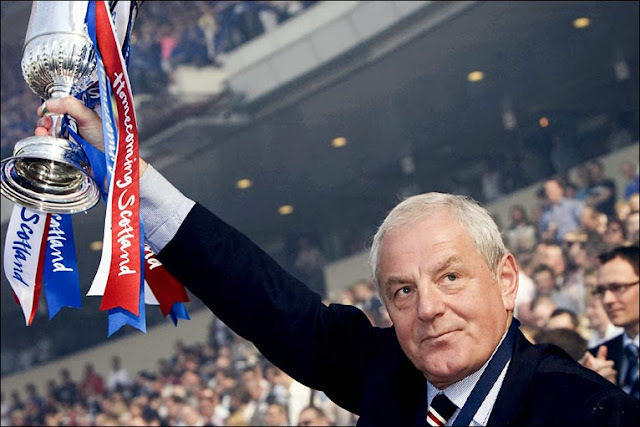 Walter Smith chooses his words carefully. There have been no bold, exaggerated statements; he hasn’t been captured chanting “Sack the Board” whilst holding up his “Spivs Out” sign. However, if this week’s events have been a reminder for anything, when Walter Smith speaks, the Rangers support sit up and take notice. In his first interview of the week at a boxing press conference, some views were split as to what his sentiments were. “I don’t think there’s a great deal of turmoil in this current board”, was one quote that provoked discussion. Did that mean Walter was comfortable with this current setup? Or did it simply mean that this board were comfortably in this current situation? When Walter Smith left his role as non-executive Chairman in August, he referred to the current board as “highly dysfunctional” and looked for “integrity” to be returned. Since his statement was released, there has been no change to the board – can Walter Smith’s views really have changed by much? However, despite this provoking some debate, his later comments have given little room for interpretation. Smith discusses his reaction to chants aimed at the board, and admitted he hadn’t seen anything like it at his time at Ibrox. From the viewpoint of a fan, although these are protests that should have taken place years ago, a reinvigorated and refreshed approach from fans has been welcomed in recent weeks. As Smith continues, he does so in his understated fashion, but it would be naive to ignore that the hints are there. When discussing the current board, Walter makes comments that most fans have had their suspicions over. It is inevitable that fans will continue to differ in their opinions of this current board, but one thing that cannot be ignored, is the views of a man that has sat on this board, before feeling that he no longer could do. These quotes should be left ringing in the ears of fans following these interviews. Fans want clarity and straight-talking from board members when it is simply not possible, but when Smith has stepped aside, he has given his words in his own fashion. It is conducted in a calm and civil manner without a word of disrespect, but the signs are clear. When Walter Smith resigned from the board two months ago, he urged fans to “back these proposed changes so that much-needed stability and a level of integrity can be restored.” This was a rallying cry for many, and many of those that backed the proposed EGM, are still fighting for change as the AGM approaches. Much in the fashion of John Greig’s resignation from the board under Craig Whyte, a club legend moving on should not be without question. In the case of Greig, his foresight was correct, although he was largely ignored (after ironically being called “thick” by Whyte’s PR spin guru). At this point, we have quotes to match Walter Smith’s departure. It may not have been presented in the way some fans wish it had been, but his opinions have been shared. Little has changed. The evidence to support this board's credibility remains in the gutter. When it comes to the AGM, will you listen to the PR work protecting self interests of the current board, or will you listen to the club icon that had his time on that board before deciding, “No thanks, I’m out”? That is one of the many questions that may help decide the future of Rangers Football Club.